Kilcoy Beauty graces Mary Street with finesse and flair. Kilcoy, “Cherchez la femme”. Donna lets you feel totally relaxed and calm during beauty procedures. Treat yourselves Ladies. Partners…Treat your ladies with a Gift Voucher, perfect for any occasion or just because. Skin care products, massage, facials, Peels, Full or mini pedicures and manicures. Get that summer tan with the latest spray tan for your skin tone. Donna ensures a full beauty service and offers various specials to cover those touch up needs, or gift ideas. Kilcoy Beauty also offers Gift Vouchers for that special well thought of gift. Kilcoy Beauty, flair, finesse and grace with all your beauty needs covered. Donna welcomes two young independent ladies to her team. For all your ILash extensions book with “ILashes with Amy” mobile 045 459 6955 and for beautiful nails book with “Nails by Ashlee” on mobile 0439 663 302. Come and say welcome and hello to the New team in the beautiful new premises in Mary Street. 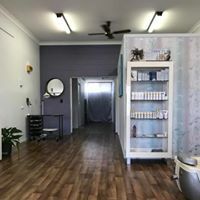 All your beauty needs covered by our very own Kilcoy Beauty Professionals.